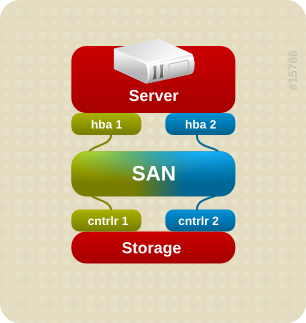 Cluster Administration — Provides information about installing, configuring and managing the High Availability Add-On. Device mapper multipathing (DM-Multipath) allows you to configure multiple I/O paths between server nodes and storage arrays into a single device. These I/O paths are physical SAN connections that can include separate cables, switches, and controllers. Multipathing aggregates the I/O paths, creating a new device that consists of the aggregated paths. This chapter provides a summary of the features of DM-Multipath that are new for the initial release of Red Hat Enterprise Linux 6. Following that, this chapter provides a high-level overview of DM Multipath and its components, as well as an overview of DM-Multipath setup. This section lists new and changed features of DM-Multipath that are included with the initial and subsequent releases of Red Hat Enterprise Linux 6. Red Hat Enterprise Linux 6.0 includes the following documentation and feature updates and changes. For the Red Hat Enterprise Linux 6 release, the initial DM-Multipath setup procedure for a basic failover configuration has changed. You can now create the DM-Multipath configuration file and enable DM-Multipath with the mpathconf configuration utility, which can also load the device-mapper-multipath module, start the multipathd daemon, and set chkconfig to start the daemon automatically on reboot. For information on the new setup procedure, see Section 3.1, “Setting Up DM-Multipath”. For more information on the mpathconf command, see the mpathconf(5) man page. A path has the same WWID as a multipath device that was previously created (even if that multipath device does not currently exist). For instructions on the procedure to follow if you have previously created multipath devices when the find_multipaths parameter was not set, see Section 4.2, “Configuration File Blacklist”. This feature should allow most users to have multipath automatically choose the correct paths to make into multipath devices, without having to edit the blacklist. For information on the find_multipaths configuration parameter, see Section 4.3, “Configuration File Defaults”. The Red Hat Enterprise Linux 6 release provides two new path selector algorithms which determine which path to use for the next I/O operation: queue-length and service-time. The queue-length algorithm looks at the amount of outstanding I/O to the paths to determine which path to use next. The service-time algorithm looks at the amount of outstanding I/O and the relative throughput of the paths to determine which path to use next. For more information on the path selector parameters in the configuration file, see Chapter 4, The DM-Multipath Configuration File. In the Red Hat Enterprise Linux 6 release, priority functions are no longer callout programs. Instead they are dynamic shared objects like the path checker functions. The prio_callout parameter has been replaced by the prio parameter. For descriptions of the supported prio functions, see Chapter 4, The DM-Multipath Configuration File. In Red Hat Enterprise Linux 6, the multipath command output has changed format. For information on the multipath command output, see Section 5.7, “Multipath Command Output”. In the Red Hat Enterprise Linux 6 release, the location of the multipath bindings file is /etc/multipath/bindings. The Red Hat Enterprise Linux 6 release provides three new defaults parameters in the multipath.conf file: checker_timeout, fast_io_fail_tmo, and dev_loss_tmo. For information on these parameters, see Chapter 4, The DM-Multipath Configuration File. When the user_friendly_names option in the multipath configuration file is set to yes, the name of a multipath device is of the form mpathn. For the Red Hat Enterprise Linux 6 release, n is an alphabetic character, so that the name of a multipath device might be mpatha or mpathb. In previous releases, n was an integer. Red Hat Enterprise Linux 6.1 includes the following documentation and feature updates and changes. This document now contains a new chapter, Section 5.3, “Moving root File Systems from a Single Path Device to a Multipath Device”. This document now contains a new chapter, Section 5.4, “Moving swap File Systems from a Single Path Device to a Multipath Device”. Red Hat Enterprise Linux 6.2 includes the following documentation and feature updates and changes. The Red Hat Enterprise Linux 6.2 release provides a new multipath.conf parameter, rr_min_io_rq, in the defaults, devices, and multipaths sections of the multipath.conf file. The rr_min_io parameter no longer has an effect in Red Hat Enterprise Linux 6.2. For information on the rr_min_io_rq parameter, see Chapter 4, The DM-Multipath Configuration File. The dev_loss_tmo configuration file parameter can now be set to infinity, which sets the actual sysfs variable to 2147483647 seconds, or 68 years. For information on this parameter, see Chapter 4, The DM-Multipath Configuration File. The procedure described in Section 5.3, “Moving root File Systems from a Single Path Device to a Multipath Device” has been updated. Red Hat Enterprise Linux 6.3 includes the following documentation and feature updates and changes. The default value of the queue_without_daemon configuration file parameter is now set to no by default. The default value of the max_fds configuration file parameter is now set to max by default. The user_friendly_names configuration file parameter is now configurable in the defaults, multipaths, and devices sections of the multipath.conf configuration file. The defaults section of the multipath.conf configuration file supports a new hwtable_regex_match parameter. For information on the configuration file parameters, see Chapter 4, The DM-Multipath Configuration File. Red Hat Enterprise Linux 6.4 includes the following documentation and feature updates and changes. The defaults section and the devices section of the multipath.conf configuration file support a new retain_attached_hardware_handler parameter and a new detect_prio parameter. For information on the configuration file parameters, see Chapter 4, The DM-Multipath Configuration File. This document contains a new section, Section 3.4, “Setting Up Multipathing in the initramfs File System”. Red Hat Enterprise Linux 6.5 includes the following documentation and feature updates and changes. The defaults section of the multipath.conf configuration file supports a new replace_wwid_whitespace and a new reload_readwrite parameter. The defaults section of the multipath.conf file is documented in Table 4.1, “Multipath Configuration Defaults”. Red Hat Enterprise Linux 6.6 includes the following documentation and feature updates and changes. The defaults section of the multipath.conf configuration file supports a new force_sync parameter. The defaults section of the multipath.conf file is documented in Table 4.1, “Multipath Configuration Defaults”. The multipath supports a -w and a -W, as described in Table 4.1, “Multipath Configuration Defaults”. Red Hat Enterprise Linux 6.7 includes the following documentation and feature updates and changes. This document includes a new section, Section 5.1, “Automatic Configuration File Generation with Multipath Helper”. The Multipath Helper application gives you options to create multipath configurations with custom aliases, device blacklists, and settings for the characteristics of individual multipath devices. The defaults section of the multipath.conf configuration file supports a new config_dir parameter. The defaults section of the multipath.conf file is documented in Table 4.1, “Multipath Configuration Defaults”. The defaults, devices, and multipaths sections of the multipath.conf configuration file now support the delay_watch_checks and delay_wait_checks configuration parameters. For information on the configuration parameters, see Chapter 4, The DM-Multipath Configuration File. Red Hat Enterprise Linux 6.8 includes the following documentation and feature updates and changes. The prio configuration parameter now supports the prio "alua exclusive_pref_bit" setting, which will cause multipath to create a path group that contains only the path with the pref bit set and will give that path group the highest priority. For information on the configuration parameters, see Chapter 4, The DM-Multipath Configuration File. As of Red Hat Enterprise Linux release 6.8, the multipathd command supports new format commands that show the status of multipath devices and paths in "raw" format versions. For information on the multipathd command, see Section 5.12, “The multipathd Interactive Console and the multipathd Command”. Red Hat Enterprise Linux 6.9 includes the following documentation and feature updates and changes. The defaults, devices, and multipaths sections of the multipath.conf configuration file now support the skip_kpartx and max_sectors_kb configuration parameters. For information on the configuration parameters, see Chapter 4, The DM-Multipath Configuration File. DM-Multipath can provide failover in an active/passive configuration. In an active/passive configuration, only half the paths are used at any time for I/O. If any element of an I/O path (the cable, switch, or controller) fails, DM-Multipath switches to an alternate path. DM-Multipath can be configured in active/active mode, where I/O is spread over the paths in a round-robin fashion. In some configurations, DM-Multipath can detect loading on the I/O paths and dynamically re-balance the load. Figure 1.1, “Active/Passive Multipath Configuration with One RAID Device” shows an active/passive configuration with two I/O paths from the server to a RAID device. 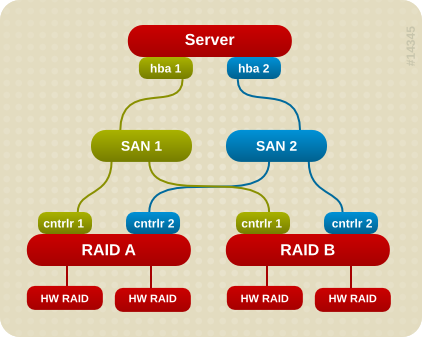 There are 2 HBAs on the server, 2 SAN switches, and 2 RAID controllers. With DM-Multipath configured, a failure at any of these points will cause DM-Multipath to switch to the alternate I/O path. 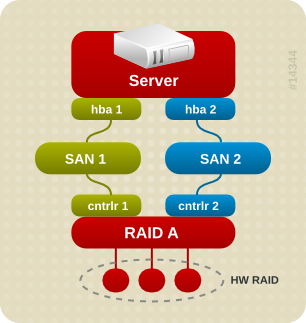 Figure 1.2, “Active/Passive Multipath Configuration with Two RAID Devices” shows a more complex active/passive configuration with 2 HBAs on the server, 2 SAN switches, and 2 RAID devices with 2 RAID controllers each. In the example shown in Figure 1.2, “Active/Passive Multipath Configuration with Two RAID Devices”, there are two I/O paths to each RAID device (just as there are in the example shown in Figure 1.1, “Active/Passive Multipath Configuration with One RAID Device”). With DM-Multipath configured, a failure at any of the points of the I/O path to either of the RAID devices will cause DM-Multipath to switch to the alternate I/O path for that device. In this configuration, I/O can be spread among those four paths. By default, DM-Multipath includes support for the most common storage arrays that support DM-Multipath. The supported devices can be found in the multipath.conf.defaults file. If your storage array supports DM-Multipath and is not configured by default in this file, you may need to add them to the DM-Multipath configuration file, multipath.conf. For information on the DM-Multipath configuration file, see Chapter 4, The DM-Multipath Configuration File. Some storage arrays require special handling of I/O errors and path switching. These require separate hardware handler kernel modules. Without DM-Multipath, each path from a server node to a storage controller is treated by the system as a separate device, even when the I/O path connects the same server node to the same storage controller. DM-Multipath provides a way of organizing the I/O paths logically, by creating a single multipath device on top of the underlying devices. Each multipath device has a World Wide Identifier (WWID), which is guaranteed to be globally unique and unchanging. By default, the name of a multipath device is set to its WWID. Alternately, you can set the user_friendly_names option in the multipath configuration file, which sets the alias to a node-unique name of the form mpathn. For example, a node with two HBAs attached to a storage controller with two ports by means of a single unzoned FC switch sees four devices: /dev/sda, /dev/sdb, dev/sdc, and /dev/sdd. DM-Multipath creates a single device with a unique WWID that reroutes I/O to those four underlying devices according to the multipath configuration. When the user_friendly_names configuration option is set to yes, the name of the multipath device is set to mpathn. When new devices are brought under the control of DM-Multipath, the new devices may be seen in two different places under the /dev directory: /dev/mapper/mpathn and /dev/dm-n. The devices in /dev/mapper are created early in the boot process. Use these devices to access the multipathed devices, for example when creating logical volumes. Any devices of the form /dev/dm-n are for internal use only and should never be used. For information on the multipath configuration defaults, including the user_friendly_names configuration option, see Section 4.3, “Configuration File Defaults”. You can also set the name of a multipath device to a name of your choosing by using the alias option in the multipaths section of the multipath configuration file. For information on the multipaths section of the multipath configuration file, see Section 4.4, “Multipaths Device Configuration Attributes”. When the user_friendly_names configuration option is set to yes, the name of the multipath device is unique to a node, but it is not guaranteed to be the same on all nodes using the multipath device. Similarly, if you set the alias option for a device in the multipaths section of the multipath.conf configuration file, the name is not automatically consistent across all nodes in the cluster. This should not cause any difficulties if you use LVM to create logical devices from the multipath device, but if you require that your multipath device names be consistent in every node it is recommended that you not set the user_friendly_names option to yes and that you not configure aliases for the devices. By default, if you do not set user_friendly_names to yes or configure an alias for a device, a device name will be the WWID for the device, which is always the same. Set up all of the multipath devices on one machine. Copy the /etc/multipath/bindings file from the first machine to all the other machines in the cluster. If you add a new device, you will need to repeat this process. Configure the aliases for the multipath devices in the in the multipath.conf file on one machine. Copy the /etc/multipath.conf file from the first machine to all the other machines in the cluster. When you add a new device you will need to repeat this process. In addition to the user_friendly_names and alias options, a multipath device has numerous attributes. You can modify these attributes for a specific multipath device by creating an entry for that device in the multipaths section of the multipath configuration file. For information on the multipaths section of the multipath configuration file, see Section 4.4, “Multipaths Device Configuration Attributes”. After creating multipath devices, you can use the multipath device names just as you would use a physical device name when creating an LVM physical volume. For example, if /dev/mapper/mpatha is the name of a multipath device, the following command will mark /dev/mapper/mpatha as a physical volume. You can use the resulting LVM physical device when you create an LVM volume group just as you would use any other LVM physical device. If you attempt to create an LVM physical volume on a whole device on which you have configured partitions, the pvcreate command will fail. Note that the Anaconda and Kickstart installation programs create empty partition tables if you do not specify otherwise for every block device. If you wish to use the whole device rather than a partition, you must remove the existing partitions from the device. You can remove existing partitions with the kpartx -d and the fdisk commands. If your system has block devices that are greater that 2Tb, you can use the parted command to remove partitions. When you create an LVM logical volume that uses active/passive multipath arrays as the underlying physical devices, you should include filters in the lvm.conf to exclude the disks that underlie the multipath devices. This is because if the array automatically changes the active path to the passive path when it receives I/O, multipath will failover and failback whenever LVM scans the passive path if these devices are not filtered. For active/passive arrays that require a command to make the passive path active, LVM prints a warning message when this occurs. To filter all SCSI devices in the LVM configuration file (lvm.conf), include the following filter in the devices section of the file. Before setting up DM-Multipath on your system, ensure that your system has been updated and includes the device-mapper-multipath package. If the /etc/multipath.conf file already exists, the mpathconf utility will edit it. If the /etc/multipath.conf file does not exist, the mpathconf utility will use the /usr/share/doc/device-mapper-multipath-0.4.9/multipath.conf file as the starting file. If the /usr/share/doc/device-mapper-multipath-0.4.9/multipath.conf file does not exist the mpathconf utility will create the /etc/multipath.conf file from scratch. If you do not need to edit the /etc/multipath.conf file, you can set up DM-Multipath for a basic failover configuration by running the following command. This command enables the multipath configuration file and starts the multipathd daemon. If you need to edit the /etc/multipath.conf file before starting the multipathd daemon. use the following procedure to set up DM-Multipath for a basic failover configuration. For information on additional options to the mpathconf command you may require, see the mpathconf man page or enter the mpathconf command with the --help option specified. Edit the /etc/multipath.conf file if necessary. The default settings for DM-Multipath are compiled in to the system and do not need to be explicitly set in the /etc/multipath.conf file. The default value of path_grouping_policy is set to failover, so in this example you do not need to edit the /etc/multipath.conf file. For information on changing the values in the configuration file to something other than the defaults, see Chapter 4, The DM-Multipath Configuration File. The initial defaults section of the configuration file configures your system so that the names of the multipath devices are of the form mpathn; without this setting, the names of the multipath devices would be aliased to the WWID of the device. Save the configuration file and exit the editor, if necessary. Since the value of user_friendly_names is set to yes in the configuration file, the multipath devices will be created as /dev/mapper/mpathn. For information on setting the name of the device to an alias of your choosing, see Chapter 4, The DM-Multipath Configuration File. If you find that you need to edit the multipath configuration file after you have started the multipath daemon, you must execute the service multipathd reload command for the changes to take effect. By default, DM-Multipath includes support for the most common storage arrays that support DM-Multipath. The default configuration values, including supported devices, can be found in the multipath.conf.defaults file. If you need to add a storage device that is not supported by default as a known multipath device, edit the /etc/multipath.conf file and insert the appropriate device information. For more information on the devices section of the configuration file, see Section 4.5, “Configuration File Devices”. If you run multipath from the initramfs file system and you make any changes to the multipath configuration files, you must rebuild the initramfs file system for the changes to take effect. By default, DM-Multipath provides configuration values for the most common uses of multipathing. In addition, DM-Multipath includes support for the most common storage arrays that support DM-Multipath. The default configuration values and the supported devices can be found in the /usr/share/doc/device-mapper-multipath-0.4.9/multipath.conf.defaults file. You can override the default configuration values for DM-Multipath by editing the /etc/multipath.conf configuration file. If necessary, you can also add a storage array that is not supported by default to the configuration file. You can run set up multipathing in the initramfs file system. If you run multipath from the initramfs file system and you make any changes to the multipath configuration files, you must rebuild the initramfs file system for the changes to take effect. For information on rebuilding the initramfs file system with multipath, see Section 3.4, “Setting Up Multipathing in the initramfs File System”. An annotated version of the configuration file can be found in /usr/share/doc/device-mapper-multipath-0.4.9/multipath.conf.annotated. The user manually forces the creation of the device by specifying a device with the multipath command. A path has the same WWID as a multipath device that was previously created (even if that multipath device does not currently exist). Whenever a multipath device is created, multipath remembers the WWID of the device so that it will automatically create the device again as soon as it sees a path with that WWID. This allows you to have multipath automatically choose the correct paths to make into multipath devices, without have to edit the multipath blacklist. With the find_multipaths parameter set to yes, you need to blacklist only the devices with multiple paths that you do not want to be multipathed. Because of this, it will generally not be necessary to blacklist devices. By default, a variety of device types are blacklisted, even after you comment out the initial blacklist section of the configuration file. For information, see Section 4.2.2, “Blacklisting By Device Name”. Table 4.3, “Device Attributes” shows the attributes that you can set for each individual storage device in the devices section of the multipath.conf configuration file. These attributes are used by DM-Multipath unless they are overwritten by the attributes specified in the multipaths section of the multipath.conf file for paths that contain the device. These attributes override the attributes set in the defaults section of the multipath.conf file. Many devices that support multipathing are included by default in a multipath configuration. The values for the devices that are supported by default are listed in the multipath.conf.defaults file. You probably will not need to modify the values for these devices, but if you do you can overwrite the default values by including an entry in the configuration file for the device that overwrites those values. You can copy the device configuration defaults from the multipath.conf.defaults file for the device and override the values that you want to change. The additional parameters to specify depend on your specific device. If the device is active/active, you will usually not need to set additional parameters. You may want to set path_grouping_policy to multibus. Other parameters you may need to set are no_path_retry and rr_min_io, as described in Table 4.3, “Device Attributes”. 1 emc: hardware handler for EMC storage arrays. retain_attached_hw_handler: (Red Hat Enterprise Linux Release 6.4 and later) If this parameter is set to yes and the scsi layer has already attached a hardware handler to the path device, multipath will not force the device to use the hardware_handler specified by the multipath.conf file. If the scsi layer has not attached a hardware handler, multipath will continue to use its configured hardware handler as usual. dev_loss_tmo The number of seconds the SCSI layer will wait after a problem has been detected on an FC remote port before removing it from the system. Setting this to infinity will set this to 2147483647 seconds,or 68 years. flush_on_last_del If set to yes, the multipathd daemon will disable queuing when the last path to a device has been deleted. user_friendly_names If set to yes, specifies that the system should use the /etc/multipath/bindings file to assign a persistent and unique alias to the multipath, in the form of mpathn. If set to no, specifies that the system should use use the WWID as the alias for the multipath. In either case, what is specified here will be overridden by any device-specific aliases you specify in the multipaths section of the configuration file. The default value is no. retain_attached_hw_handler (Red Hat Enterprise Linux Release 6.4 and later) If this parameter is set to yes and the scsi layer has already attached a hardware handler to the path device, multipath will not force the device to use the hardware_handler specified by the multipath.conf file. If the scsi layer has not attached a hardware handler, multipath will continue to use its configured hardware handler as usual. detect_prio (Red Hat Enterprise Linux Release 6.4 and later) If this is set to yes, multipath will first check if the device supports ALUA, and if so it will automatically assign the device the alua prioritizer. If the device does not support ALUA, it will determine the prioritizer as it always does. all_devs When this parameter is set to yes, all of the options set in this device configuration will override the values for those options in all of the other device configurations, both the ones in the configuration file and the built-in defaults. The following configuration sets no_path_retry to fail for all of the built-in device configurations. If you need to resize an online multipath device, use the following procedure. By default, swap devices are set up as logical volumes. This does not require any special procedure for configuring them as multipath devices as long as you set up multipathing on the physical volumes that constitute the logical volume group. If your swap device is not an LVM volume, however, and it is mounted by device name, you may need to edit the fstab file to switch to the appropriate multipath device name. Determine the WWID number of the swap device by running the /sbin/multipath command with the -v3 option. The output from the command should show the swap device in the paths list. This line causes the udev device manager to run multipath every time a block device is added to the node. Even with this line removed, the multipathd daemon will still automatically create multipathed devices, and multipath will still be called during the boot process for nodes with multipathed root file systems. The only change is that multipathed devices will not be automatically created when the multipathd daemon is not running, which should not be a problem for the vast majority of multipath users. If a multipath device is configured with features "1 queue_if_no_path", then any process that issues I/O will hang until one or more paths are restored. To avoid this, set the no_path_retry N parameter in the /etc/multipath.conf file (where N is the number of times the system should retry a path). Setting the no_path_retry parameter overrides the feature option features "1 queue_if_no_path", even if this features option is set in the devices section and no_path_retry is set in the defaults section of the multipath configuration file. Note that you must specify the mpathn alias rather than the path. When you create, modify, or list a multipath device, you get a display of the current device setup. The format is as follows. If the path is up and ready for I/O, the status of the path is ready or ghost. If the path is down, the status is faulty or shaky. The path status is updated periodically by the multipathd daemon based on the polling interval defined in the /etc/multipath.conf file. The dm status is similar to the path status, but from the kernel's point of view. The dm status has two states: failed, which is analogous to faulty, and active which covers all other path states. Occasionally, the path state and the dm state of a device will temporarily not agree. The possible values for online_status are running and offline. A status of offline means that this SCSI device has been disabled. When a multipath device is being created or modified, the path group status, the dm device name, the write permissions, and the dm status are not known. Also, the features are not always correct. If you should have occasion to remove the device-mapper-multipath rpm. file, note that this does not remove the /etc/multipath.conf, /etc/multipath/bindings, and /etc/multipath/wwids files. You may need to remove those files manually on subsequent installations of the device-mapper-multipath package.